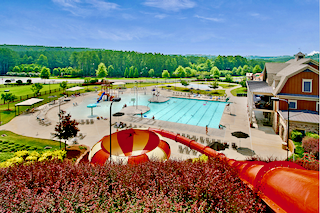 Upon arrival, in Seven Hills subdivision in Dallas Georgia, you'll find the amazing 13 Acre amenity park the whole family can enjoy. From the Marvelous Monkey Mansion to the Clubhouse and 10 Tennis Tennis Courts, from Seven Hills Super Saucer Water Slide to the winding nature paths around our Sport Courts, our distinct Seven Hills Park is the centerpiece of this fabulous subdivision. Whether you have a houseful or an empty nester, Seven Hills offers homes for sale that fit your style and needs. In the Windsong at Seven Hills active adult section, there are low maintenance Ranch homes that let you live the way you want without all the care and hassles. New homes for sale feature many smaller custom home builders, so you're sure to locate the home and lifestyle that fits you...from Family Living to Active Adult. You can choose from new homes in Seven Hills, or very nice pre-owned homes at affordable and wide price ranges. Even the well known DR Horton homes are building in the newest Seven Hills at Double Branches section. There are several individual sections within Seven Hills that allow you to choose the one that best suits your family. All sections are included in the search below so you won't be missing out on anything listed. However we have some listings that are not listed yet or other new construction options worth checking out. Request Seven Hills new home floorplans not listed yet at floorplans@teamleehomes.com or simply fill out the below form. An extensive list of conveniences are built in at Seven Hills in Dallas, Georgia. CVS, Publix and neighborhood shopping are within 1 mile of the subdivision. Click here to view the Seven Hills HOA Covenants. Directions:Seven Hills is Located In Dallas, Ga in Paulding County.Take I-75 to Glade Road (Exit 278). Turn left. At 3rd light (Hwy 92), turn right. At Hwy 41, turn right. Pass Hwy 92 and turn left at light on Cedarcrest Road. Seven Hills is approximately 5 miles on the right. FOR PRIVATE SHOWINGS, CALL TEAM LEE THE SEVEN HILLS EXPERTS TODAY! !